I was initially underwhelmed by Nepali food, which pretty much consists of two foods: momos and dal bhat. Momos are steamed dumplings stuffed with vegetables, pork, chicken or buffalo. I later found out that momos are actually appropriated from Tibetan cuisine. 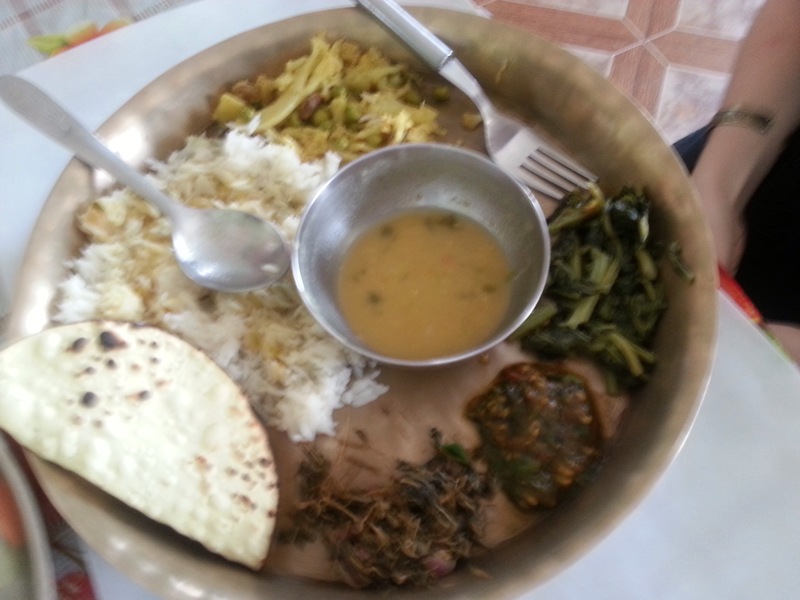 Dal bhat is the true Nepali national food. While technically “dal bhat” only refers to the lentil-and-rice dish, in Nepal it is always served with a full thali – a complement of foods including pickled vegetables, a tomato-and-pepper spicy sauce (something like salsa), papad (crispy flatbread), a yogurt sauce, takari ( a mixed vegetable curry), and steamed spinach, all served with lots of rice. One of the more generous Nepali food blogs (which, in itself, is almost a contradiction in terms) grandly stated that the dal bhat thali was a perfectly complete dish in that it contained all tastes: sour, salty, spicy, etc. When a friend’s sister made us dal bhat in her home, it did finally seem like a perfectly complete meal. The tourist dal bhat was a little too bland for that. The flavors were complete along a more subtle range – it wasn’t like eating jalepenos in one bite and then sugar cubes and then pickles – but there were multiple tastes that each brought one another out. When I say it was subtle, for example, the “sweet” taste came from the cauliflower dish. Cauliflowers are sweet, like carrots, but normally that sweetness is overwhelmed by other flavors. Other than dal bhat, there’s not a lot of Nepali food, although a lot of Indian food is available since Nepal borders India. 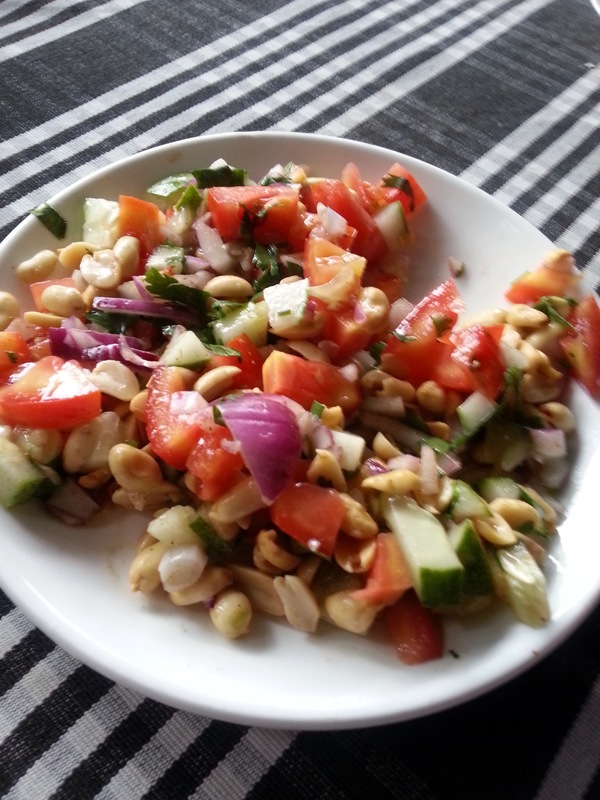 By far the best Indian dish I had was peanut sadeko or peanut masala, a salad made of whole roasted peanuts tossed with chopped onions, cucumbers, tomatoes and carrots and seasoned with spice such as coriander, turmeric, etc. This recipe seems close to what we ate, although there were more vegetables in what we had. Finally, we also had some Tibetan food, including momos (of course) and hot Tibetan beer. 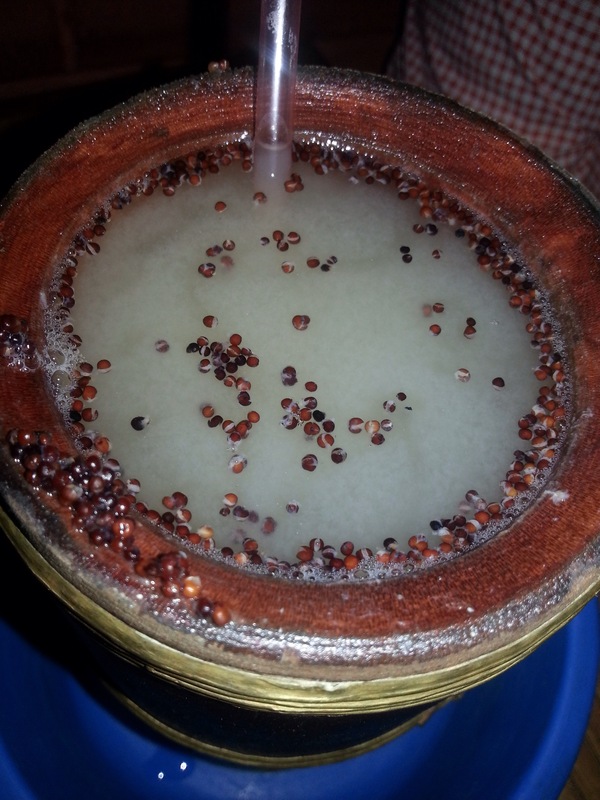 This beer is made from fermented millet and served in a hot mug stuffed with millet. There was a smell like baked bread, which was pleasant, but underneath something more like sake that almost turned my stomach. My friend, however, liked it just fine and even claimed it helped her stomach feel better. By the way, there is no such thing as “yak butter” since the yak is the male of the species. It’s actually “nak” butter. I was able to have some yak cheese – hard, tasted a little like Havarti – but yak milk wasn’t availaable since yaks can’t live at the lower altitudes in Nepal. 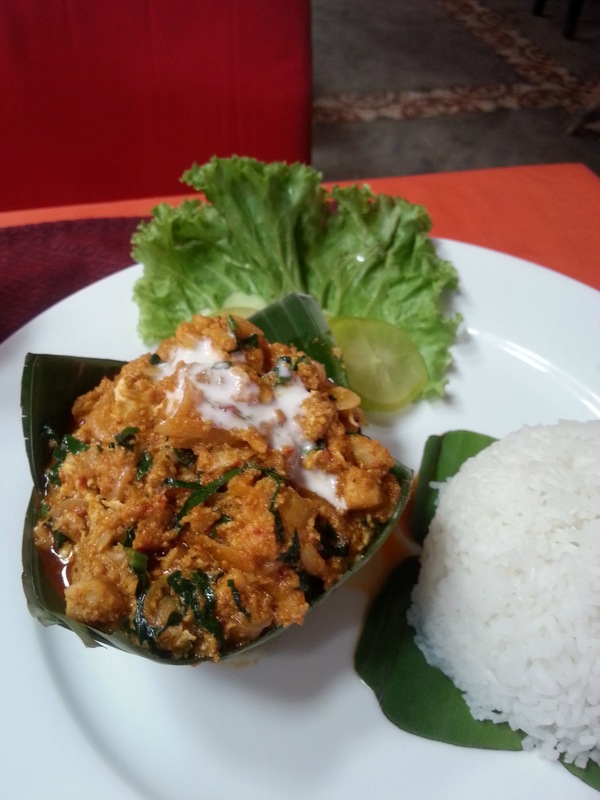 Cambodian chicken amok is much sweeter than Thai chilis; the white stuff on top is extra coconut milk. It’s normally served steamed in a banana leaf. I finally tracked down the elusive Thai breakfast dish: joke, or rice congee. It’s elusive because the Thai don’t have foods that are for breakfast only, like breakfast and eggs. And in fact most Thai don’t eat breakfast at all, waiting utnil 10 or 11 a.m. to have the first meal of the day. It was the same in Nepal. 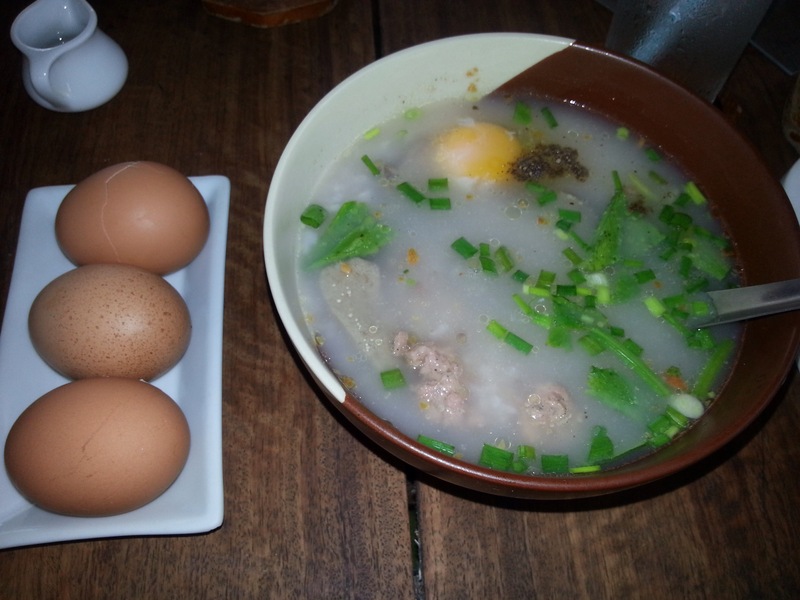 The one exception is joke, a rice porridge with pork or chicken in it, plus soft-boiled eggs and cilantro for garnish. It’s a very mild dish, but filling and good nonetheless. 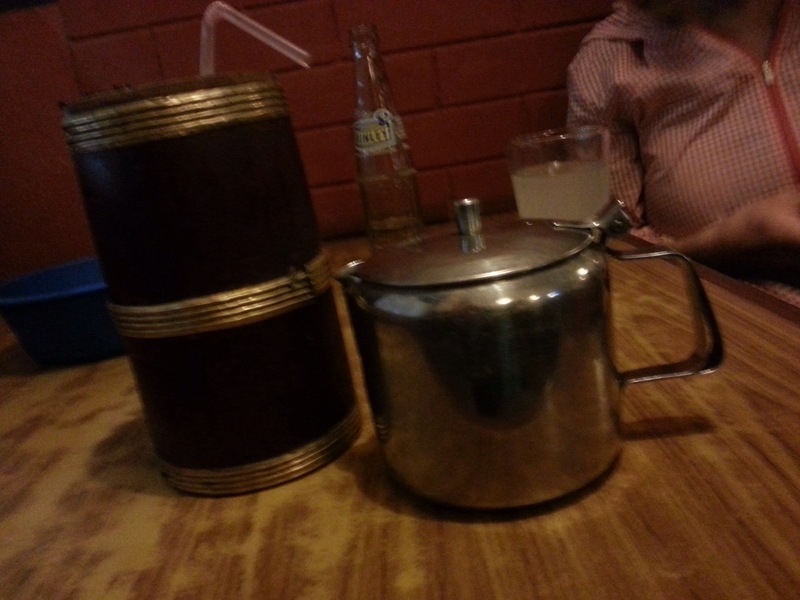 This entry was posted in Food, Travel and tagged Cambodia, Food, Nepal, Thailand. Bookmark the permalink.